It's time for the New Product Launch! All the Stamps, Die-namics, and Stencils can be found HERE. Please remember to visit each of the MFT Designers' September New Product Launch posts on the MFT Blog and leave a comment by the end of the day on Thursday, September 7 for your chance to WIN one of two, $100 Gift Vouchers. Ready? Set. Comment! I have a couple of cards to share with you today, they both feature the amazing Blessed and Blessings Die-namics. I love this set of dies! I played with the Peerless Watercolours to create the background for the first card. I had to let go of my need to control the process as the ink randomly made its way around my card stock. Yes, that is hard for me. 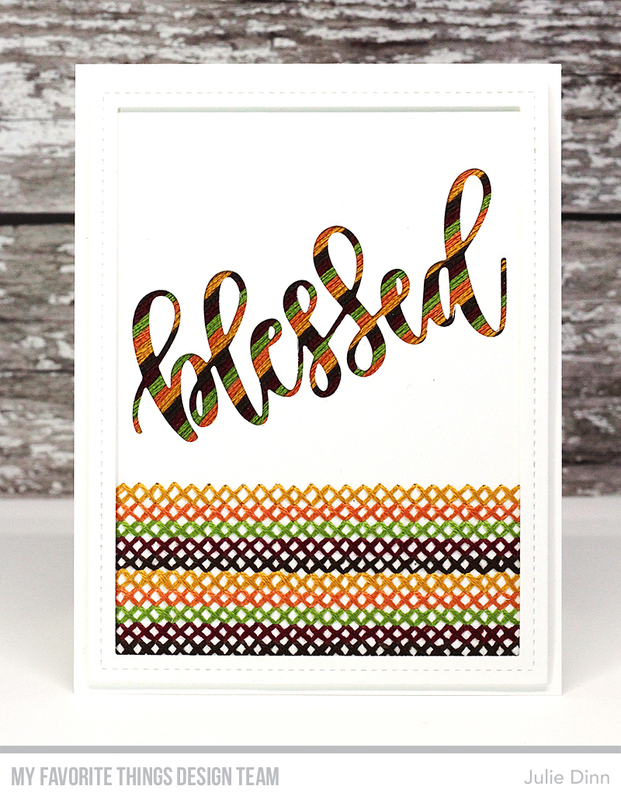 LOL The word blessed was die-cut in Hot Fudge card stock and then placed on the card once the ink was dry. I finished off the card with some Pretty Pink Posh sequins. I've been seeing lots of stitching on cards lately, and I couldn't resist breaking out some of my DMC floss to create this card. The fall colours go so well with this sentiment. WOW!! Both cards are beautiful but the one with DMC stitching is off the charts! Fantastic job!! LOVE the brilliant peerless colors that developed. It's gorgeous. These cards are so beautiful! I love how you used the floss on your second card. That is a great idea! Love this blessings die. Both your cards are fabulous. Beautiful fall cards! Love the colors! Love that 'blessed' die! Lovely cards! Love the background (letting go is hard for me, too!) you created on the first one and the stitching on the second. Thank you for the chance to win! Both of your cards are lovely, love this new blessings die! Beautiful cards. I especially like the first card. Love the "uncontrolled" background you designed. I have a hard time with letting go and letting the watercolor go wherever, too. Love these cards! Especially the stitched one. Thanks for the inspiration. Amazing cards! Love the stitching and colors used.Thank you for sharing. The cross stitching does seem to be time consuming on that second card, but all worth it! I especially love the watercolor background on the first card. Both of your cards are great. But I might have a slight preference for the first one because of the bright colors you've choose. I like the colors of your first card. Awesome cards. Love this newly released products, beautiful work! Thanks for sharing your pretty inspiration! Wow! Beautiful crossed stitch card! Love the colors on both beauties! Beautiful creations! Love the stitched card it's awesome!! Beautiful cards! Love all the rustic colors! 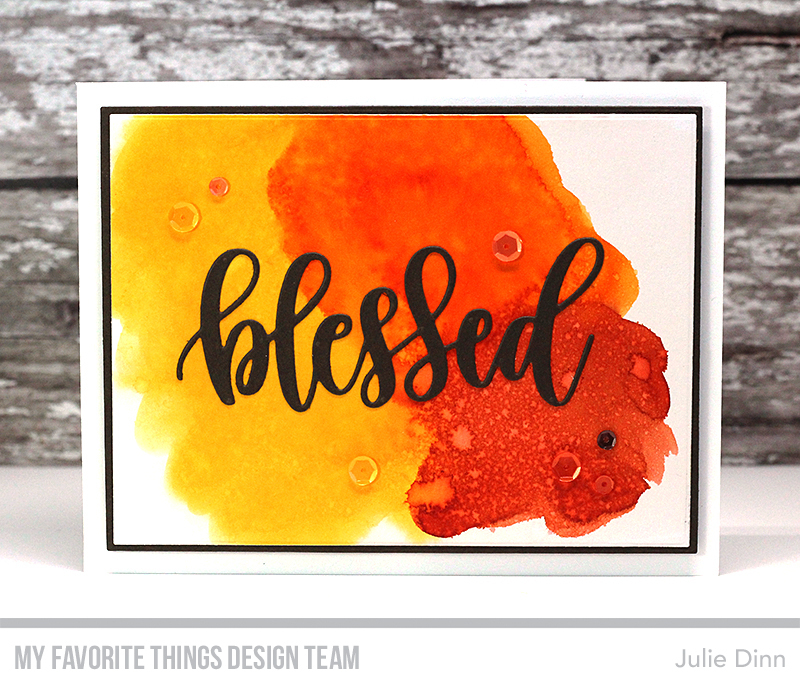 Fabulous cards Julie, love the new blessed and blessings dies. Thanks for all the inspiration! Very creative cards. Love the stitching. Great cards! Love the stitching! Hey, Jules! Both cards are beautiful, but your stitched card is over the top! I love it so, so much. I love the warm, fall colors! You nailed it. Such beautiful cards! I love the colors and holy wow you did a beautiful job on the stitching! Love the stitching on your card!! Beautiful, warm autumncolors! I like it! Lovely cards using this Blessed die. Really like how "Blessed" pops on 1st card! Love all the stitching. Gorgeous. Beautiful cards. Love the stitching feature. Also, the colorful background is beautiful. Love these. Such different looks for the same die.